This is a list of new Tasmanian plants that we have in the nursery. These can be species that we haven't grown before, or new forms of other species. For many of the new forms few pictures are available yet, but links will be provided as we get more. New plants will be added as they become available in the nursery. At one time Lanky Buttons were probably widespread in the grasslands from Brighton to Campbell Town. Then Europeans, and more to the point sheep, arrived, and they disppeared from much of the landscape. They hung on in only a few sites, notably two churchyards in Jericho and Bothwell. Now it's time to return them to the landscpe. We originally grew quite a few for a farmer in the midlands who is restoring part of her property to pre-European conditions, and have now grown more plants from seed from this initial batch. Lanky Buttons is a daisy , with the flowers held on quite long ('lanky') stems. It prefers dry conditions, and will handle cold. It dies back to a lesser or greater extent after flowering, but reshoots in spring. After goodness knows how many years looking at plants in Tasmania I can still be surprised. I was looking at the list of genera in the Tasmanian Vascular Plant Key and noticed Imperata there. I thought to myself that it must be introduced, as this is the genus of the widely grown Japanese Blood Grass. Lo and behold, no it wasn't - Imperata cylindrica is also native to coastal areas of NE Tasmania. So, we collected some, and were able to propagate it by division. Now we have it for sale. It is an elegant, hardy spreading grass with broad, tall blades. The upper third of each blade is tinged with red, making for an attractive plant. It prefers drier areas and full sun, and is good for coastal conditions. 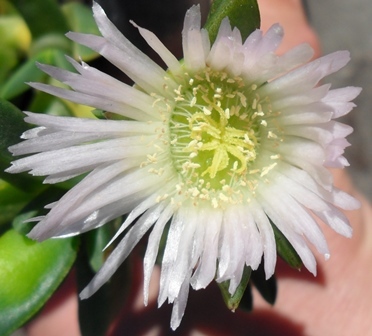 Carpobrotus rossii, usually called Pigface, is a common plant of the seaside and occasionally dry inland areas well-known for its sprawling habit, bright pink flowers and edible fruits. Our good friend Les Payne at Pulchella Nursery found an unusual white-flowered form at Dolphin Sands, near Swansea. He's passed it on to us, and we now have it for sale. The flowers often have the faintest touch of pink in them. Pterostylis curta Blunt Greenhood We are slowly increasing our range of native terrestrial orchids. Terestrial orchids have underground tubers that are formed a bit like potatoes, on the end of thick roots. After flowering, the plants die off, but then new shoots form from the tubers a few months later. In good conditions each plant produces 3-5 new tubers, meaning that a colony rapidly forms. Pterosylis curta is one of these colony-forming species, and is easy to grow in a pot or in the garden. The grass-green rosette of leaves that appears in autumn gives rise to a flower stem capped by a single, fascinating greenhood flower. For some reason, the labellum (a specialised bit of the flower) is always twisted in this species, and apparently twisted in the same direction in all cases. Xerochrysum sp Yellow and Pink Everlasting A few years back we released Xerochrysum sp. Linda's Pink, which were grown by cuttings from a Xerochrysum papillosum plant with pink flowers (they're usually white) that turned up in the nursery. This new plant is the next stage of process - we collected seed from Linda's Pink to see what the offspring would be like. There was clearly a bit of crossing going on with yellow-flowered Xerochrysums in the nursery, as some of the seedlings had pink flowers, some yellow, and one had pink buds opening to yellow flowers. We've propagated this plant, and now have it for a sale - it starts out pink, but then turns to yellow as the flowers open. Otherwise it is a typical Xerochrysum - fast growing, short-lived, and appreciates a hard prune after flowering. Follow the link for some photos. Leptospermum lanigerum Petal Point Spread Leptospermum lanigerum is a widespread and quite variable species. It typically grows up to 6 m. However, this form is low-growing, reaching only about 0.5 m in height, and spreading to 1-2 m. It has attractive blue-green leaves and white flowers in spring. This form comes from one of Tasmania's special botanical places, Petal Point, in the far north east of the state. Petal Point is regularly blasted by strong westerly winds, and therefore many of the plants are reduced in size, and, importantly, maintain that growth habit in the garden. Correa reflexa 'var. nummulariifolia' You often find 'Correa reflexa var. nummulariifolia' in mainstream nurseries, as this plant has been grown in the trade on the mainland for many years. There's a major problem, however - what is grown with this name is not the true C. reflexa subspecies nummulariifolia, which only grows on a few islands in Bass Strait. The mainland forms come from the coast to the west of Melbourne, and are like the true subspecies (which has round leaves, like coins - thus the name), but not quite. The reality is that there is great variability in Correa reflexa, and probably more than a bit of crossbreeding with Correa alba and C. backhouseana has occurred. Even the true subspecies nummulariifolia may be just a fertile cross from sometime in the past. It turns out that the nearly but not quite nummulariifolia form grows in Tasmania as well, and we now have it in production. Like the mainland version, it is a spreading, low-growing shrub that grows well in coastal conditions. It has greenish flowers in winter and spring, much loved by honeyeaters. Our plants originated from Bell Buoy Beach near George Town, a little Correa paradise. One day we'll get to Flinders and find the true Correa reflexa ssp nummulariifolia. Eucalyptus cordata ssp cordata Eastern Tasmanian Silver Gum Eucalyptus cordata comes in two forms - the western form, which grows on Snug Tiers and along the Wellington Range, has square branchlets a bit like a Blue Gum, while the eastern form, which grows at scattered locations from Ridgeway (only a few hundred metres from the nursery) to the east caost, has round branchlets. The western form is a small tree that makes a good windbreak. The eastern form is very different, growing as a low shrub - I can only find one good image on the web. The plant that seed was collected from was about 1 m across by 50 cm high. Quite how it will do in the garden I am not sure - this is a plant to experiment with.